Just wanted to notify the people who are following the art lessons in my St. Joseph Art Workshop tab that I just published Lesson 4: Applying Color and Modeling the Face. You need to go to the Menu tab above and click on Lesson 4 to see it. My next post in the St. Joseph’s Art Workshop tab will be Lesson 5. It will be the last post in my Art Exercise of Painting Sacred Images using Acrylic Paint. To all those that have expressed interest in the FREE on-line sacred art workshop that I am offering here at fraangelicoinstitute.com please note that yesterday I posted Lesson 3 in Exercise 1: Painting an Image of St. Rose of Lima. Just click on the St. Joseph’s Art Workshop Tab on top of the image of St. Gabriel and the Virgin Mary and you will see the first Workshop page. If you have already visited the Workshop Tab then just continue to scroll down to find the Lessons that I have posted so far. I am putting all the Lessons in one place because it will be easier for you to scroll up and down to refer back and forth to other Lessons for Exercise 1. More lessons will be posted in the upcoming weeks. You have enough to read and keep you busy for now! Feel free to participate and enjoy the process of creating art! I hope you had a blessed Feast of Pentecost! Please read Part 1 of “Fra Angelico – Heaven on Earth” (posted here on May 16, 2018) in order to receive a proper introduction to the Isabella Stewart Gardner Museum’s extraordinary exhibition that, unfortunately, closed this weekend..
As you moved into the gallery that exhibited this once in a lifetime collection of Fra Angelico paintings you first saw the beautiful painting entitled The Ascension of Christ, The Last Judgement, and Pentecost (the Corsini Triptych). It is painted in egg tempera with gold leaf on a wood panel. 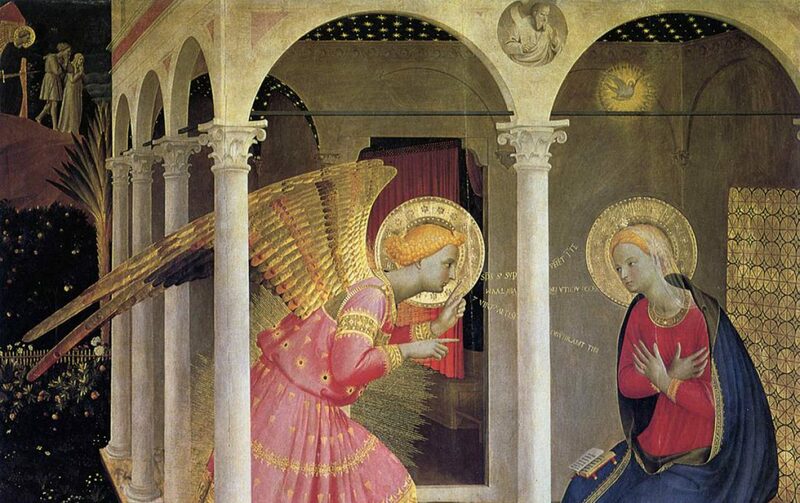 Fra Angelico painted it during the years 1447-1448, seven years before his death in 1455. It was loaned to the Gardner Museum from the Galleria Nazionali d’Arte Antica di Roma – Galerie Barberini Corsini, Palazzo Corsini. The following quotation is taken from the Exhibition’s commentary found on the right side of the painting. Mesmerizing in its detail, Fra Angelico’s painting pictures three biblical events. At left, Christ ascends into heaven over the heads of the Virgin Mary and the Apostles. At right, a masterfully foreshortened dove – the Holy Spirit – descends to earth. The story culminates in the center. Christ passes judgment over the living and the dead, saving the worthy (left) and condemning the wicked (right). While the damned cower from fearsome devils who attack the poor souls with claws, angels embrace the blessed. “This small devotional triptych – a painting with three parts – served a cultivated individual, probably a cleric (deacon, priest, or bishop) in Rome.” Please compare its three episodes to others in my upcoming posts. In the above painting Fra Angelico adopts a vertical presentation. This energizes the connection and communication between heaven and earth. The Gardner Museum’s curator remarked that this technique “enlarges the central scene, and emphasizes” the Catholic Church’s spiritual power. Fra Angelico, as a Dominican priest, desired to present that Jesus’ act of Redemption (passion, death, and resurrection), and His Ascension back to the Father, made possible the moment of Pentecost. Christ’s actions enabled the eventual opportunity for our free will to choose to accept His Truth and be fed by the Spirit’s power. It is the Father and the Son’s will to have the Holy Spirit nourish us through His grace. This grace is available to us through the proper administration and worthy reception of the Holy Sacraments. Thus, we come to the central panel – the Last Judgement. Did we freely accept His Sacramental grace or did we ignore, and thereby, reject it? At that moment will we be on the right or the left of Christ? Allow me to make some personal points on the three close-up photos below. In the first panel of this painting, notice the gold work around the body of Christ. I was allowed to closely examine it. I have never seen a painting’s gold work done with such precision and delicacy. It is not just gold leaf that is applied in a flat manner to the panel. It appears to be actual raised strands, or threads of gold, all applied with great precision. As you slowly move left or right around that part of the painting you notice the light catching the gold and literally radiating and shimmering around the image of Christ. The Ascension, with Pentecost below. Second, the image of Pentecost, with the Blessed Mother in the center of the Apostles as the dove hovers and the fire of the Holy Spirit descends upon them and gives them the gifts and fruits of the Holy Spirit (Isaiah 11:23; 1st Corinthians 12: 4 ff; Galatians 5: 22 ff). Notice St. Peter, filled with conviction, speaking to the assembly of men below (“Peter’s Discourse” found in the Acts of the Apostles chapter 2, verses 14 ff.). Also, notice the clothing on one of the men who gather outside of the upper room listening to Peter: the detail of the lace work on the bottom of one of his garments, and the shadows on the man’s red leotard/shoe. If you stand away from the painting at approximately eight to ten feet to take it all in (as you see in the panoramic top photo) you don’t notice all the detail; but the blessed Fra with his extraordinary perception, noticed the need for it, and he painted it in. A master of detail, and as a true maestro, he knew how to successfully accomplish it. Wonderful! The last two close-up pictures are below. My photos (through the kindness of the Isabella Stewart Gardner Museum), and my text © Deacon Paul O. Iacono 2011-2018. Photos taken with an iPhone 6, no flash. The mission of the Fra Angelico Institute for the Sacred Arts is to teach the truth, goodness, and beauty of God through the prayerful creation of sacred art. We are happy to announce that we have recently entered into a partnership with Thomas More College of Liberal Arts to present a wonderful on-line course to anyone interested in Catholic Culture and the sacred art of the Church. We also have a special opportunity for teachers of history, art, religion, and the humanities in Catholic high schools of the Diocese of Providence who complete this course. Thomas More College of Liberal Arts is offering an on-line course entitled The Way of Beauty. This course has been designed by David Clayton and is being successfully implemented at Thomas More College of Liberal Arts. David is an Oxford University graduate, sacred artist, published author and broadcaster, and holds the position of Artist-in-Residence and lecturer in Liberal Arts at the College. David is passionate about Catholic art and music, the forms it has taken through the centuries, and the reinvigoration of Catholic culture. David’s blog can be found at www.thewayofbeauty.org. As stated on the College website the Way of Beauty course “focuses on what shapes a Catholic culture and what makes it beautiful. It discusses the general connection between worship, culture and beauty particularly through the prism of visual art. The course program consists of a 13 episode video series and an e-book written by David Clayton. This book is only available to those who take this course. Participants who complete the on-line program are eligible to receive 25 hours of Continuing Education Units endorsed by Thomas More College of Liberal Arts. The College is regionally accredited by the New England Association of Schools and Colleges. Time spent in this program may also be able to be used towards later college credit offerings.” The cost of the on-line course is $99.00. For the 2014-2015 academic year, The Fra Angelico Institute will provide reimbursement scholarships, through a competitive selection process, to Diocese of Providence high school teachers who enroll and complete the Way of Beauty on-line course. In an attempt to provide a competitive atmosphere among the teachers, The Fra Angelico Institute for the Sacred Arts will provide a total of five reimbursement scholarships, one per high school, to Catholic high school teachers with the best implementation process. 1) Notify the Fra Angelico Institute of their interest through our email at frainstitute@cox.net. 2) Formally register by clicking on the tab and following the prompts for the On-Line Course through www.thewayofbeauty.org. 3) Through the teacher’s personal Google account, participate in the program which consists of 13 on-line videos (approximately 30 minutes apiece) produced in association with Catholic TV. 4) Read the e-book – The Way of Beauty: Liturgy, Education, Art, and Inspiration. This e-book has been written exclusively for this course. 5) Submit on school stationary a statement from the teacher that the course has been completed, a one-page summary of how the course will be actually implemented in their curriculum, and one or two suggestions on how the course may be improved. 6) Submit a letter from the principal of their high school stating that they support the teacher in their desire to implement the goals of this course. Using the US Postal System, these documents should be mailed to: Deacon Paul Iacono, Fra Angelico Institute for the Sacred Arts, St. Francis of Assisi Church, 114 High Street, Wakefield, RI 02879. We hope you enjoy the course and best wishes to the teachers who compete for the reimbursement scholarships! In the late 19th century a Russian painter, the noted portraitist, draughtsman, and teacher Ivan Kramskoi painted a haunting image of Jesus alone in the desert. It is a painting which expresses the internal struggle of the flesh versus the spirit. It portrays Jesus, in the early morning hours and the cold air of the dawn, with the sun rising over His back. He is surrounded by small boulders and sits on a rock, hands in front of him, eyes filled with anguish and pain. This portrait of Christ in the desert is not one of victory; looking closely at His face you recognize the seriousness of the struggle and the irrefutable fact of Jesus’ humanity. Observe Christ’s clenched hands, gaze deeply into His eyes, and you will see the artist’s portrayal of a Savior that is already at the beginning of His ministry aware of the viciousness of the tempter and the burden of our sins that will weigh upon Him. Kramskoi’s painting is so powerful because it shows not the physical tearing that was to come in the scourging and crucifixion, but the sensual, psychological, and spiritual battles that would challenge the mission and authority of Jesus Christ. Jesus had to confront, in that very first desert assault, whether or not He was going to be faithful to His mission; was He going to be faithful to the anointing that He received from the Father and the Spirit at His baptism? The Gospel challenges us with the same questions: are we faithful to our Baptismal promises? Are we faithful to the Commandments? Are we faithful to the call that we received at our Confirmation to live and practice the truths that He taught us, not just when we feel like it, but everyday – even in the most difficult of circumstances? As disciples of Christ we are on a daily basis constantly revolving around the axis of temptation and sin – faith and grace. We understand that temptation, in and of itself, is a test – it is not sin. It is only sin when we willfully place ourselves in its power, when we give into its power to overwhelm our body and soul, – a deadly power that obtains its animus and energy from the original tempter – Satan himself. Christ lived blamelessly in the face of evil, but you say, I am not Christ, I am a weak man or woman, boy or girl. I say true, we all are, but by virtue of our faithful reception of the Sacraments we have the power of Christ’s grace within us. Unlike Christ we don’t enter the wilderness of our own temptations alone. When we do face the anguish of our own sin, our own desolation in the face of Satan’s onslaughts, when we peer over the edge of the pit of sin – Christ’s witness tells us “Do not despair. Do not dwell in the pit. Do not accept the pit of sin as being permanent.” Jesus Christ tells us that He has instituted a Church that, with all its human sins and imperfections, still exists – in purity – to convey through its clergy the grace of God. One of the first things that you notice about Christ in this portrait is that here, at the beginning of Jesus’ ministry, the artist has Jesus’ hands clasped together. Yet, when you walk into a Catholic or Orthodox Church, and look at the crucifix or an icon of one, you see Jesus as He ends His ministry on the Cross, with His hands unclasped, and stretched out, stretched out for each one of us. This Lenten season we need to reach out our hands to the One, who 2000 years ago, stretched out His hands for our Redemption – and who still reaches out for us today. Reach out to Him in prayer and the Sacrament of Reconciliation, and through Jesus, reach out to those around you who are suffering in the same way, and lead them back to the love of Christ.